We buy junk cars, vans, SUVs, and trucks and pay cash in Iowa! Is your car a clunker you’re looking to get rid of? Would you like to earn some money while you do so? We’re The Clunker Junker, and we’re Iowa’s number one choice for anyone looking to sell their junk car for cash. Our prices are competitive, our service is fast and we’re 100% committed to your complete satisfaction. Looking to turn your unwanted or junk car into cash? We make the process easy, quick and profitable. Did you know that sliced bread was invented in Iowa? Well, The Clunker Junker’s cash for junk cars service is the best thing since! Rather than deal with Iowa junk car buyers who are more crooked than Snake Alley in Burlington, let us make an instant offer on your vehicle. We buy junk cars of all makes, models, and conditions. So don’t waste your time putting up ads online when you can answer a few simple questions about your car and have a guaranteed instant offer right now. You might be tempted to just roll your junk car into West Okoboji Lake so you don’t have to deal with it anymore, but we’ve made it so easy to sell your car in Iowa there is no need! (That’s also very illegal). We’ll give you a deal on your car that is sweeter than Iowa corn. As tempting as it may be to simply hide your unwanted car in a corn field, there’s an easier way. We buy junk cars from all across the Hawkeye state. We provide fast service to all the major cities such as Des Moines, Cedar Rapid and Davenport. But we haven’t forgotten about the rest of the state. We buy plenty of junk cars from the residents of Clive, Newton and other small towns throughout the state. Basically, we’re able to reach more Iowans than the Iowa State Fair! Use the quick tool on our website to input your car’s year, make, model and trim. We’ll ask you to detail the damage as accurately as you can. More damage doesn’t equal less cash in hand, so don’t spare any of the specifics. We’re able to instantly give you an offer. As you’d expect from an Iowa business, we won’t give you the runaround. You’ll see a fair offer which contains no hidden fees or other surprises. Junk car removal is always included in our offer, you never pay for towing. Our Iowa junk car buyers will arrive at your location – and we’re usually able to do so between one and three days. We’ll give you cash or a check directly on-site, and leave with your car, keys and title (if applicable). You don’t have to drive your car anywhere, haggle with any salesman or do much of anything, really. We’ll pay you, pick up your car and be out of your hair. How Much is My Junk Car Worth in Iowa? These cars often look like they’ve been dragged out of the bottom of Red Rock Lake. We’re talking about cars which don’t run and are covered in rust, dents and other damage. We value these cars by their size and weight. You’ll typically earn anywhere from $50 to $185. These cars still have some life left inside. They might run and have a few working components. Because these cars are pieced out, we’re able to offer more. Typically, these cars sell for a few hundred dollars. We have put together a simple guide and example for how to sign your Iowa title when you are selling your vehicle. If there are multiple owners listed on the title, they must all sign the title unless the names are separated with "OR". In Iowa you should be signing and printing your name on the back of the title towards the top in the "Assignment of title" section. Do not write anything in the re-assignment by dealer sections of the title. 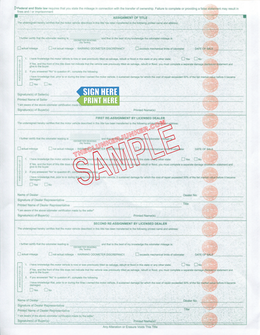 First sign the back of the title where indicated by "Seller(s) Signature(s)". 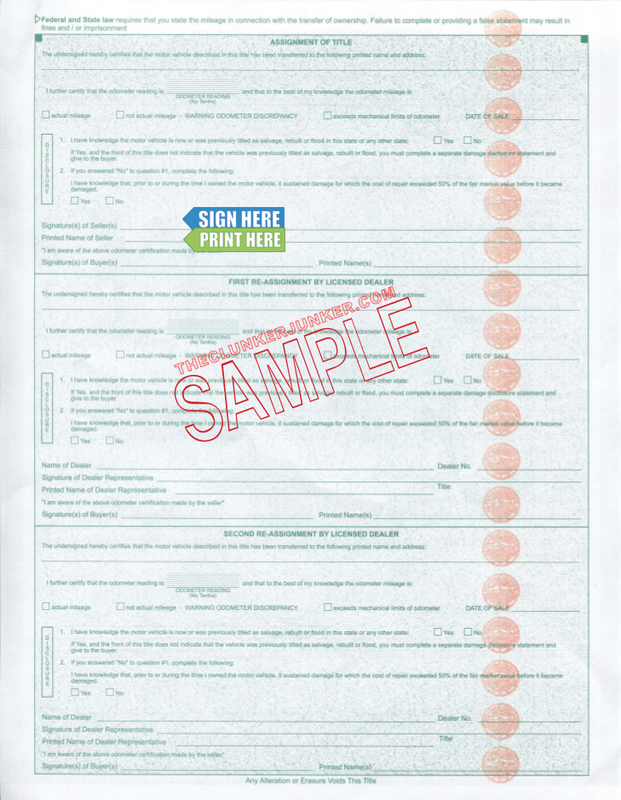 Print (don't sign) your name on the back of the title where it reads "Printed Name of Seller". 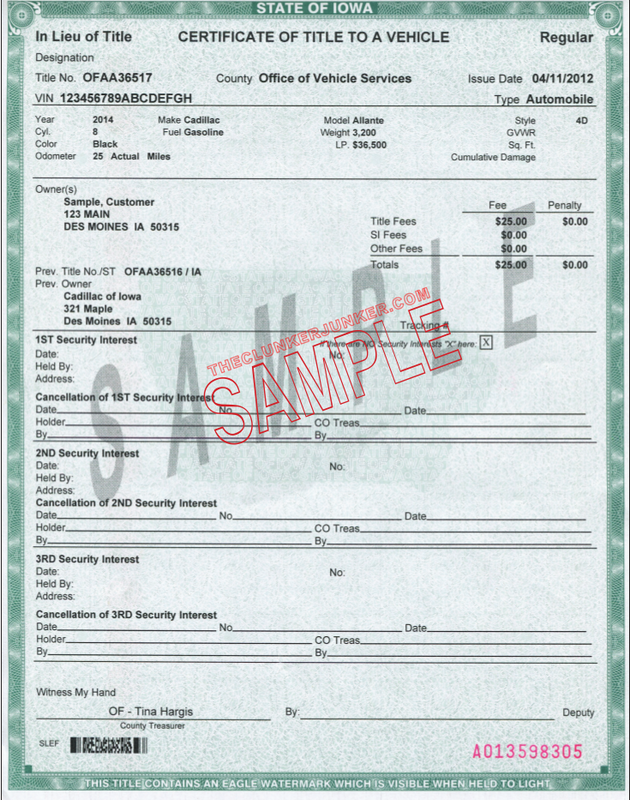 Fill out the Iowa form 411033 Application for Duplicate Title. Bring the form to your local county treasurer's office. The fee for a replacement Iowa title is $25.00. Getting rid of an abandoned vehicle in Iowa can be a difficult process. Unfortunately, you cannot just sell any junk car that ends up on your property if you do not own it. You'll need to follow the Iowa abandoned vehicle removal procedures. We have given a general overview of what that entails below. Attempt to locate the legal owner of the vehicle using the VIN 17-digit number. To have a vehicle removed from your property, you must submit an Application for Authority to Transfer a Vehicle to a Demolisher to your local law enforcement. After review and processing, if the applicant is approved, the responsible law enforcement office will grant a Certificate of Disposal of an Abandoned Vehicle. After you have received a Certificate of Disposal of an Abandoned Vehicle, you may apply for a Junking Certificate. You may use a Junking Certificate in lieu of title to dispose of the vehicle. In some cases, law enforcement may remove the vehicle on your behalf. Will you still buy my car in Iowa if I don’t have the title? No, we cannot purchase your car, truck, or SUV unless you have a valid title in your name. However, as the legal owner you will be able to easily obtain a duplicate title from the Iowa MVD, at which point we would be able to help you sell your vehicle. 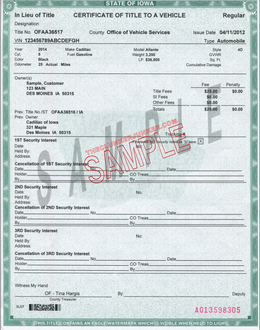 Iowa often changes their title documents from year to year. If you have questions about your specific title, please contact your Iowa MVD. Yes, unless you are transferring the plates to a new vehicle. You can return the plates to your local MVD office. You may need to notify your local MVD that you have sold the vehicle. You can contact them with any additional questions or concerns about the transfer of your title. Iowa’s too beautiful to let a junk car clutter up your life. We’ll meet you at your location quickly to give you the cash you need and remove the car you don’t. Contact us today to start the process. "The vehicle was crashed into a lamp post. It was driven home, but it hasn't been driven since. The hood won't open along with the front passenger door. The passenger-side airbag deployed, and the windshield is cracked. " "The car just had the alternator and the starter changed. The battery was tested and is still good. The car won't start. I can't afford to keep putting cash into it. It was bought in February from a private owner and worked great for a couple of weeks, then the alternator went out. I was not able to get the car smogged in order to register the vehicle, and I cannot get in contact with the previous owner." "I purchased this vehicle in January of 2015. It has been lightly driven since that time, and it gets good gas mileage. The brakes started being testy this past week." "The vehicle was driveable the last time I saw it. It does have one low tire, and it needs new tires, a new CD-player, cruise control, a back wiper arm, and one window is off the track but still rolls up and down. It also needs a new battery. It's approximately $3,000 in repairs, by my estimation, to fix it. I didn't want to put that much into it, so I didn't fix it. Most of the components and parts are newer or gently used due to me keeping up with the maintenance. I have the paperwork for every bit of maintenance that has been done on it." "I know nothing about vehicles. I have had trouble for almost a year with it overheating. A friend also said that something is wrong with the transmission. It needs to be jumped to start randomly, and then it's fine for a couple of weeks. I don't have cash to put into it to figure out what is wrong." "The vehicle has a rust hole in the fuel tank, so it will start and drive, but the fuel leaks out within a day. I was a hazmat responder, and the vehicle is equipped with emergency lights and radios which will take me about a week, weather permitting, to carefully remove. Then, I will call when it's ready for removal." The Clunker Junker is one of the top junk car buyers in the state of Iowa. To date we have made instant offers on over 10 thousand vehicles across the state, totaling over $3.2 Million offered! We were not able to purchase many vehicles without a valid title. We also buy cars on a wide spectrum of conditions and 55% of the vehicles we've made offers on in Iowa do not start or drive. Many also have moderate to severe body damage. Des Moines in Warren County/Polk County was our top producer, followed by Cedar Rapids.